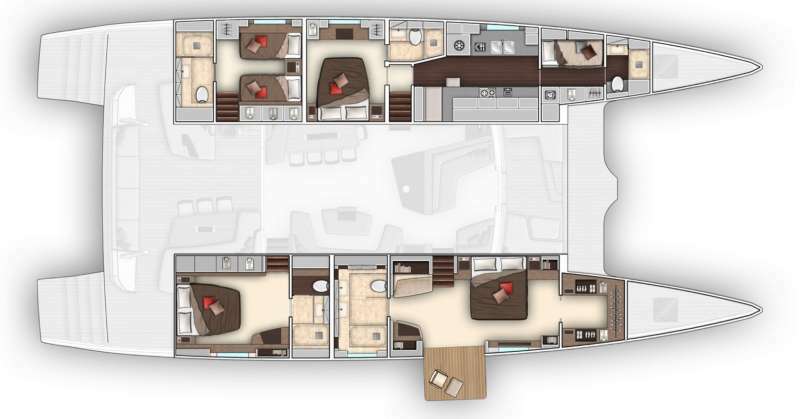 Captain Gareth Wood has been at the helm of superyachts for more than 12 years, most recently the brilliant luxury charter catamaran Xenia74 with his wife and Chef, Kristine Andreassen. Prior to his career in the charter industry, Gareth was trained in Dental Technology, lecturing worldwide on orthodontics, always with a yearning for more time on the water. He holds dual South African and British passports and his love of travel was one of the prime motivators to pursuing a career in the charter industry. After fulfilling his Captains qualifications, he made the leap into superyachts full-time. More than a decade on, Gareth has managed several vessels in charter, with hundreds of charters under his belt, as well as handling three cross-Atlantic deliveries and overseeing complicated refits on behalf of owners. He has extensive experience in boat mechanics, plumbing and electrical systems, and certification as a sailing and scuba diving instructor. During his career, Gareth has skippered yachts in the world’s premier charter destinations such as the Mediterranean, Caribbean and Mexico, and many remote and exotic locations such as Phuket and Myanmar. When he’s not working, Gareth enjoys films, books and snow skiing, but the water holds particular allure for him and spear fishing, free diving and underwater photography are high on his list of hobbies. To each and every charter Gareth brings his full professionalism and passion for the yachting lifestyle to the benefit of his fortunate guests, many of whom become return clients. Chef Kristine is widely acclaimed as one of the best and most accomplished in the business, praised by guests for expertise and sheer deliciousness of the meals and morsels she prepares. Drawing on the world’s cuisines and cultures, Kristine conjures mouthwatering menus with a myriad of options to satisfy all palates, from those with simple tastes to the seasoned connoisseur. American by birth, Kristine grew up assisting her dad in all facets of his charter business in St Thomas. She is capable and confident around yachts of all sizes, and adept at managing a charter vessel while catering to the needs of guests from all walks of life. In her role as Chef and First Mate, Kristine contributes to the overall success of operations onboard: the sailing, upkeep of the vessel, and management of crew, always with the ease of a professional undertaking their true calling. Apart from cooking, with is her love as well as her livelihood, Kristine enjoys running for fitness and fun, horseback riding and delving into history. She is a certified dive instructor and qualified in First Aid and CPR. Together with her husband Gareth, Kristine is an exceptional proponent of the charter industry and her warmth and wisdom make her popular with guests who praise her gastronomic scope and satisfying blend of home-cooking and cuisine.